Instant Imprints Centennial, CO | Custom T-Shirts, Embroidery, Signs and More! At Instant Imprints South Metro in Centennial, Colorado, our customers come to us when they want to be more visible to their customers. We create that visibility five different ways: Branded Apparel (embroidery), Signs & Banners, Promotional Products, Custom T-Shirts and Print Services. Thank you for printing up my banners on such short notice. The quality and color are amazing! I’ll be back for all my printing needs. At Instant Imprints in Centennial, we pride ourselves in having a set of core values that our business abides by. These values are that we get your job done right the first time, that we get your order done on time (or early) and that we aim to deliver an exceptional quality promotional product. With a wide variety of items and garments available to customize, you can slap your logo just about anywhere you can imagine. No matter where you want to take your brand, custom t-shirts can bring your logo there. We have a variety of production processes available so you can get the perfect style of shirt for your project. If you’re not sure of what shirt decorating process is right for you, our Image Experts are more than happy to help you, every step of the way. In addition, our custom embroidery offerings can bring a whole new level of sophistication and durability to your branded goods! 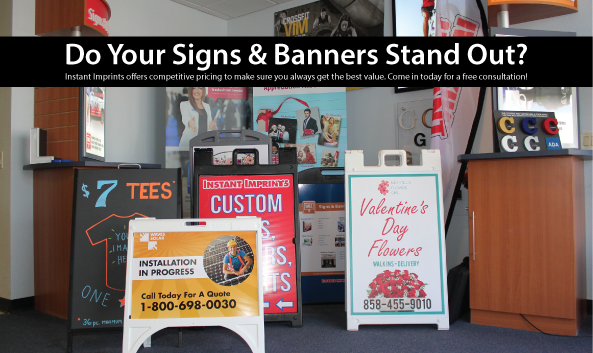 When you want to bring your brand to the masses, it’s time to stand tall with a custom sign or banner. Across Centennial and beyond, there’s a way to reach your prospective customers with a custom sign. From sidewalk signs to banners big enough to see from space (almost), your Centennial Instant Imprints can help to get your brand noticed. Banners are portable and reusable ways to bring your brand vision wherever it is most effective. If you’re ready to bring your brand visibility to the next level, come by our Centennial showroom, give us a call at (303) 771-2244 or request a quote online today!